It’s National Sewing Machine Day in the USA—a day to celebrate the invention of one of the greatest time-saving devices in America. 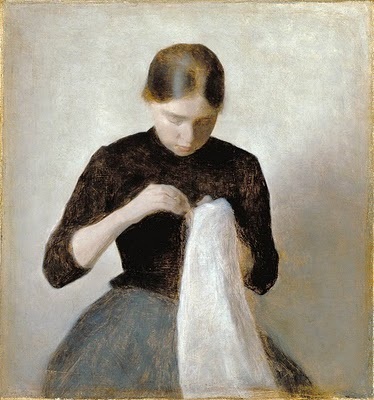 If you’ve read any of Isabella’s books, you get a sense of how many women slaved over their sewing to keep their families in decent clothes; or how many women plied their needles 10 to 12 hours a day to earn a living. The sewing machine changed all that. One hour of machine sewing produced the amount of work once accomplished by about 15 hours of hand sewing. That kind of statistic placed sewing machines in high demand. And there were plenty of machines to choose from. Competing manufacturers helped keep prices down, so new machines they were affordable for most middle-class households. 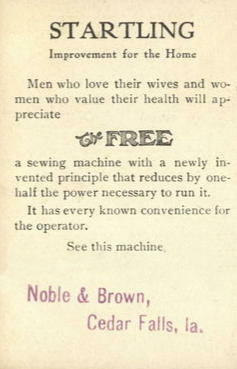 For those families who could not afford to purchase a machine out=right, some companies (like The Free Sewing Machine Company) allowed customers to purchase a machine on time. This was an innovative marketing ploy, since the concept of individuals purchasing on credit was largely unheard of in the late 1800s and early 1900s. The introduction of the sewing machine made a huge impact on how America produced clothing, bedding, linens, curtains and draperies . . . essentially, any fabric-based item that we wear or use in our homes and businesses. 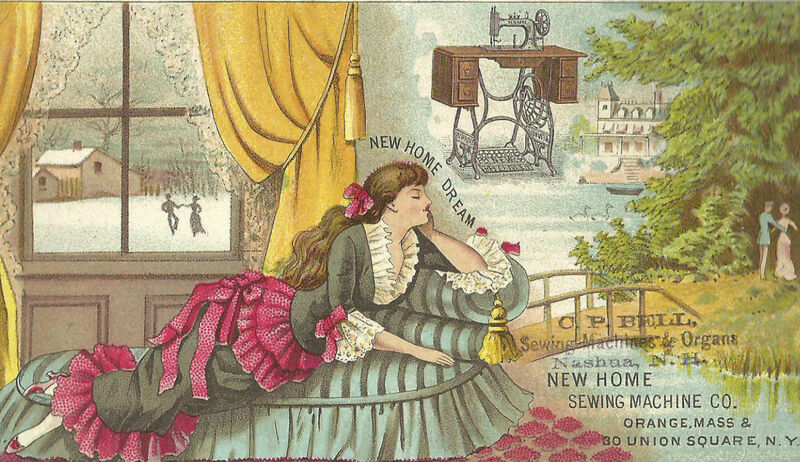 You can see more images of sewing machines, including trade cards and magazine ads, on Isabella’s Pinterest board. Click here to visit Pinterest. I n Twenty Minutes Late, Caroline Bryant’s mother supported the family by working in a canning factory during the growing season. 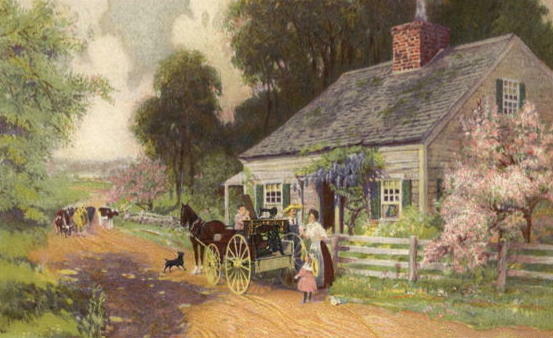 In the winter she earned her money by sewing and taught Caroline to sew fine stitches by hand. During Caroline’s stay with Dr. Forsythe’s family, she makes friends with Mrs. Packard, the housekeeper. One day Caroline watches Mrs. Packard use a sewing machine and wishes (with a heart-felt sigh) that she could buy a sewing machine for her mother so she can ease her mother’s burden. Watchful Mrs. Packard, who had become a good friend to Caroline, heard the sigh. “Does your mother sew on a machine?” she asked. Mrs. Packard kept her own counsel, and Caroline went away unaware that she had said anything of special interest to anybody. 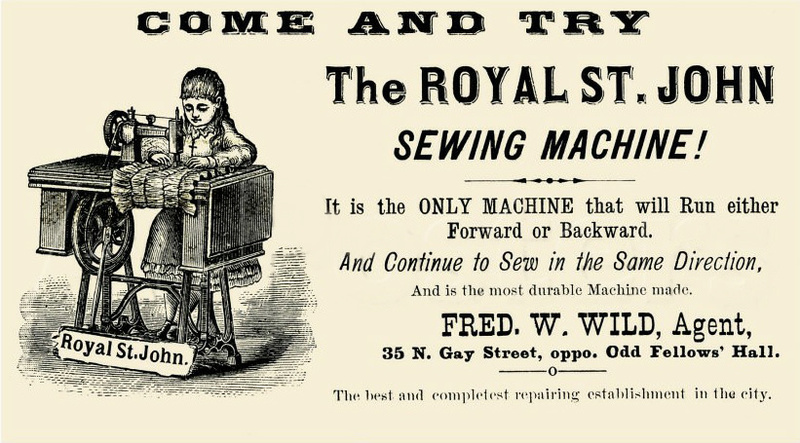 In 1893, when Twenty Minutes Late was first published, sewing machine sales were booming; and their affordability made it easy for most families to own one. No wonder, then, that Mrs. Packard was astonished that Caroline’s mother supported the family with hand-sewing. A hand-crank sewing machine manufactured circa 1875. At the time Twenty Minutes Late was written, sewing machines weren’t new. They’d been on the market for many years, particularly in commercial settings; but it wasn’t until the mid-1800s when they began to be mass-marketed to consumers. 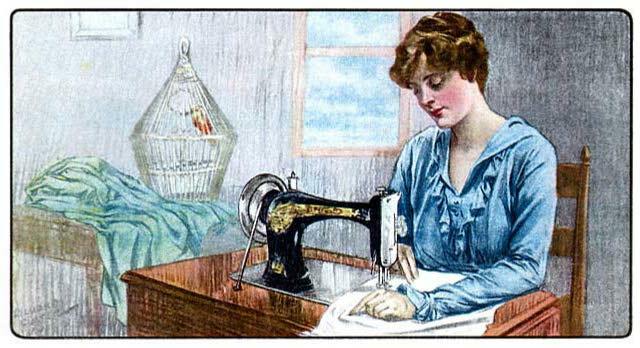 In 1885 The Singer Manufacturing Company began selling sewing machines directly to the public for home use. 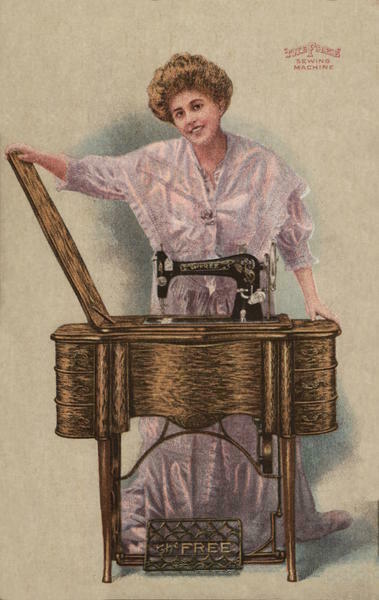 Early Singer machines featured a foot-operated treadle; and in 1889 Singer introduced an electric sewing machine to consumers. 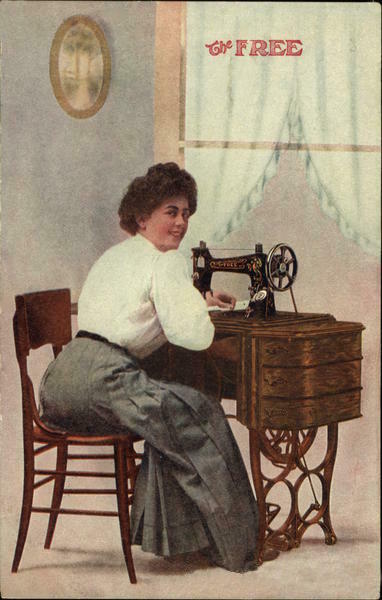 By the late 19th century, other companies were producing sewing machines for home use, as well; and most companies allowed purchases on credit, making it easier for families to obtain a machine. 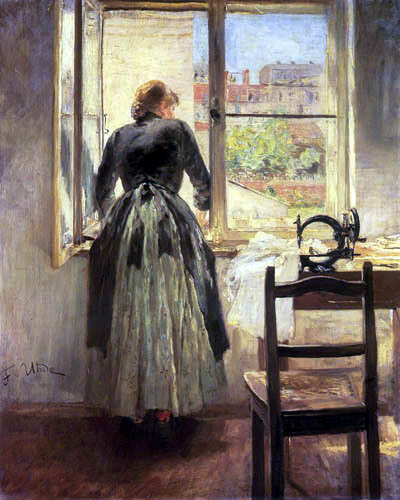 An 1890 painting by Fritz von Uhde shows a dressmaker using an older “turtle back” sewing machine (so named because of the machine’s shape). 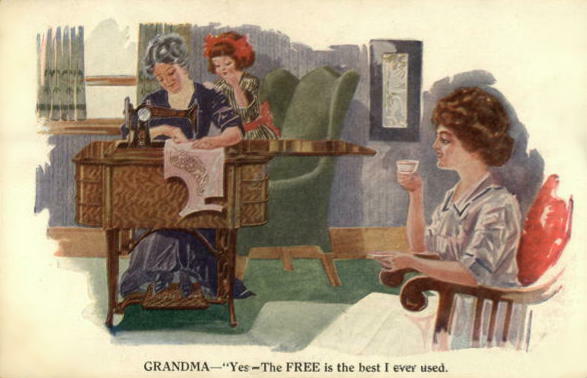 The 1908 advertisements below feature a sewing machine ingeniously marketed under the name “The Free.” The Free sewing machine was distinguished from other machines as “the only insured sewing machine warranted for life.” The company pledged to replace any machine “destroyed or injured” with a brand new machine, without cost. As sewing machines became more readily available, they also became more affordable. 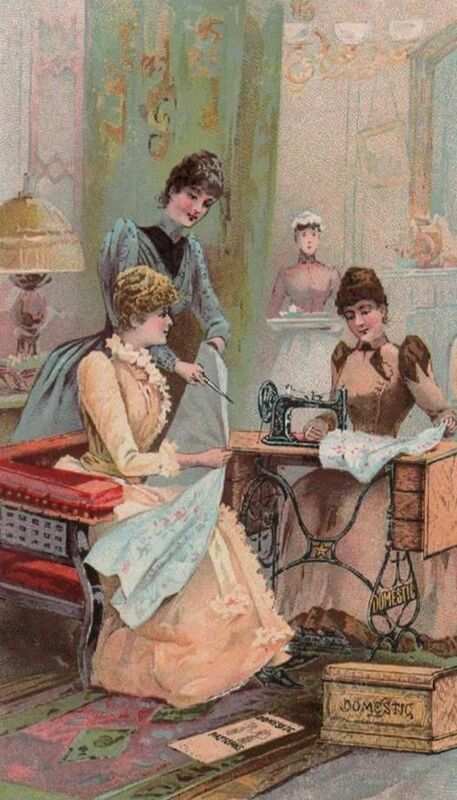 This turn-of-the-century advertisement depicts how enjoyable—and leisurely—life can be with a sewing machine in the home. 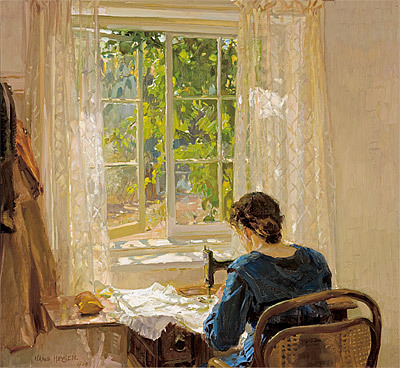 And this 1913 painting by Hans Heysen depicts a sewing machine set up beside a charming, sunny window for use by the lady of the house. Elias Howe’s Sewing Machine – This article features a comparison of the time it took in the 19th Century to sew various articles of clothing by hand verses machine. Some of the comparisons are astonishing. Sewing & Notions – Etui – Lovely images of vintage sewing machines and accessories. Singer through the Ages 1850-1940 – A timeline of the Singer Manufacturing Company and its innovations. The History of the Singer Sewing Machine – A brief history of the Singer sewing machine with wonderful illustrations.